One of the items on this year’s bucket list was to take Athena camping. I’m embarrassed to say that she’s never been before, especially since I loved camping as a child and it’s one of my earliest memories. We wanted her first overnight camping experience to be in eastern Canada so it would be similar to what I remembered as a child. We packed our bags and made our way to Fundy National Park in New Brunswick to experience camping like never before for all of us. With minimal camping gear with us on our extended vacation in New Brunswick, we didn’t know how we were going to make overnight camping work. When I found Fundy National Parks’s oTENTik experience, I knew it was the perfect fit. 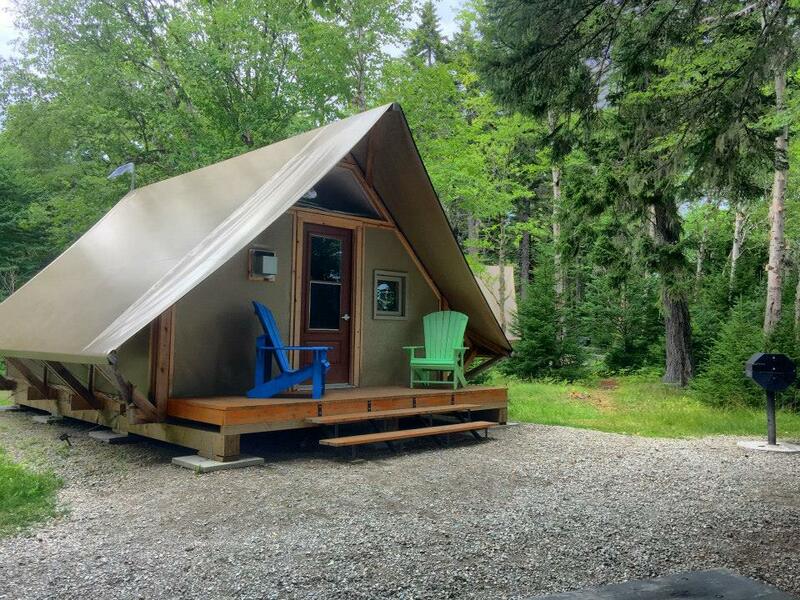 The Parks Canada oTENTik is a spacious blend of tent and rustic cabin equipped with beds and furniture on a raised floor. It’s not exactly roughing it but it’s a great introduction to camping and tenting. Darren and I never camped in an oTENTik before either so it was a new experience for all of us. Outside the oTENTik, there is a parking space, a picnic table, two deck chairs and a charcoal BBQ. Inside, there is a table, 4 chairs, a bench, a sleeping area, a solar-powered light and a propane heater. All we needed was bedding, food and drinks, cooking gear, propane and a lighter. Athena was bursting with excitement when we arrived. She climbed up and down the bunk bed steps dozens of times and anxiously awaited s’mores. Since the BBQ was propane, we used waffle cones and stuffed them with marshmallows and chocolate. Wrapped in tinfoil, they roasted beautifully on the grill and tasted delicious. As we sat in the chairs and ate our s’mores and hotdogs, we watched a pair of squirrels run and play around us. Even though we were only 1 km from the town of Alma, we felt like we were having deep woods camping experience. At night when it was time for sleep, Athena used her flashlight as a nightlight and we made shadow animals on the side of the tent. It was everything I imagined our first camping experience to be with woodland creatures and delicious food around a fire followed by snuggling up in the tent while telling stories and drifting off to sleep. 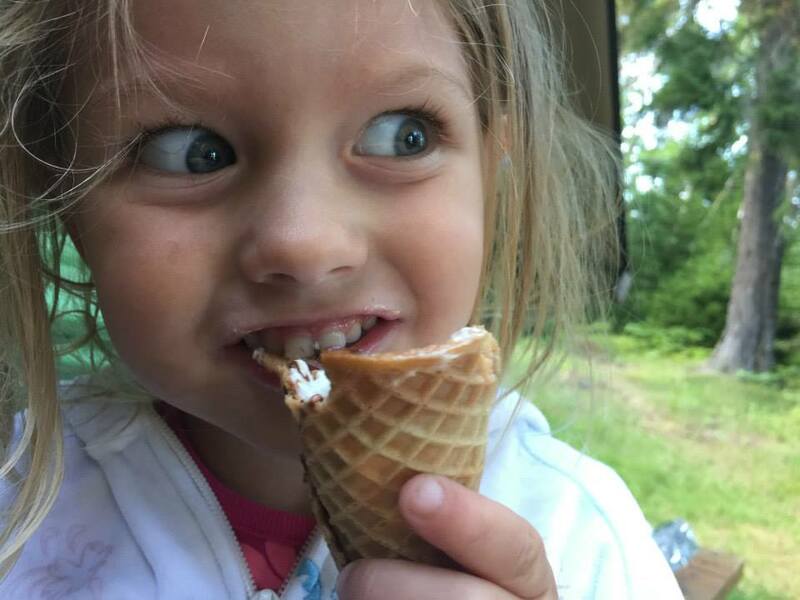 This entry was posted in Canada, New Brunswick, Travel and tagged bucket list, Camping, ExploreNB, Family, family travel, Fundy National Park, Parks Canada, tenting, travel by lesleycarter. Bookmark the permalink. Ooh–sounds like my kind of camping. Great pics of memories to cherish. Sounds like the kid form of glamping! And in such a lovely area of Canada. Happy travels! There was tons of room for us. A whole other family could have joined us and we still would have been comfortable. Have you ever been to Fundy National Park? I always thought camping in a cabin was somehow cheating, but at age 70 I think this would change my mind! I still love to camp in a tent and do it frequently at Waianapanapa in Hana Maui but with young child this is definitely a fun alternative. Sounds like a fun time was had by all, which is the most important part. And though I love primitive camping, not every trip has to be roughing it. Sometimes it’s awesome to do something a little different! Wonderful! I look forward to reading about more of your adventures! Wonderful way to go camping. I am Canadian but on the west coast. You leave me longing to visit the east coast asap. I have a ton of relations there, too. I’m sure your girl will forever remember her first camping experience, lovely! Both my family and my husband’s family live on the east coast so we usually spend a lot of time here but I love the west coast as well. Which province are you in? Did you make it to the Reversing falls in St. John (https://webetripping.wordpress.com/2012/09/08/the-canadian-maritime-provinces/)? We did that a few years ago. Glad Athena had a great time, I bet you guys had a blast. The tents look awesome! That kind of camping is right up my street! Cheryl and I visited New Brunswick in May. We spent time exploring the Fundi Trail which is beautiful and drove thru Fundi Park to the Hopewell Rocks. The tide changed 38 feet the day we were there! Was this your first time visiting? Did you visit other provinces as well? I have always wanted to try out one of these for my blog. Thanks for sharing. I love camping, but I wouldn’t if I had to rough it. I want a hard floor and a door I can lock when I sleep, so either a cabin or a camper of some kind works for me. I’m glad Athena’s first camping trip was so great for her. You are such a great mom! Athena is so lucky to have outdoorsy experiences. I didn’t go camping for the first time until I was 22! Athena is on the fast-track to outdoor and nature know-how. Have fun! Thank you, Marissa! We try to expose her to as much as possible and let her decide what she likes doing most. It’s nice to have things for the whole family. What did you think of camping when you first went? Hi Lesley! My first camping experience was hilarious because I agreed to live in my boyfriend’s truck with him for a year, and we visited 30+ national parks, Canada, and Mexico! I agreed to it without ever having camped before because I loved him so much and wanted to spend that quality time. Even after living in a car we’re still together after 8 years! We figured after living in a car together there’s nothing we can’t handle! That’s both funny and sweet. I couldn’t agree more. If you want to really know someone, just travel with them. I remember when your little girl was born – and now here she is with her folks on a Canadian camping experience! She’s a lucky little girl – and so adorable, too. Enjoy! Thank you! I feel like it was just last week that she was born and now I see her doing so many things that I didn’t expect for years. It really does happen over night. A far cry, though, from the tiny backpack two-man tent which was my introduction to this pastime. Still, when the bug bites, it will probably get to that! Nice! My youngest never liked camping, though I tried a few times. A set up like this might have made the difference! I hope that she likes tent camping as well. I think when we go back to California, we’ll try a spot on the beach. I’ll let you know how it goes. How old was your youngest when you first took her? I’m wondering if I waited too late. we just took ours camping for the first time, too – and we rented an RV and met the grandparents at the campsite. Similar to you : not roughing it, but being outside a lot and enjoying summer and family and s’mores! Wow, that is a long way from camping when i was a kid. We just pitched a tent, and slept in a sleeping bag. How times have changed. Civilised camping – like it. What a great way to camp! I loved the smores idea of using a waffle cone! What a great first time experience. The look on your daughter’s face with the cone indicate that you will be camping a lot in the future. It is so special when your plans work out they way your dream. Thanks for sharing your story.